Notice the fine lines around this patients mouth? 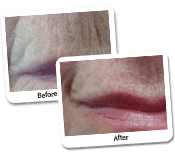 These creases are one of the typical signs of aging and can be treated using our highly specialised Erbium laser. This is the patient post Erbium laser resurfacing. There is a dramatic improvement in the texture of her skin. The fine lines and creases have faded and her lovely lips have once again become the main focus. Signs of ageing cannot only appear around the eyes, because wrinkles, deep lines and creases can also appear around the mouth. Fortunately, this particular area can be treated with Erbium laser, which is used during a laser skin resurfacing treatment. 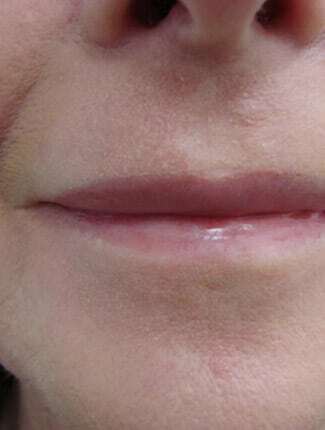 What Signs of Ageing Did the Patient Have Around the Mouth? 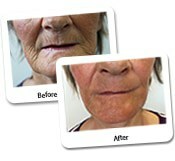 The patient in this case study was suffering from fine lines around the mouth. Even though these fine lines are a common sign of ageing, they made the appearance of the patient in this case study look older. Fortunately, these types of fine lines can easily be treated with Erbium laser. What Treatment Was Chosen to Treat the Fines Lines in This Patient? To treat the fine lines that were present around the mouth of the patient in this case study, laser skin resurfacing with Erbium laser was executed. The laser resurfacing procedure removed the fine lines that made the patient look older, but also caused a dramatic improvement in the skin texture of this patient. 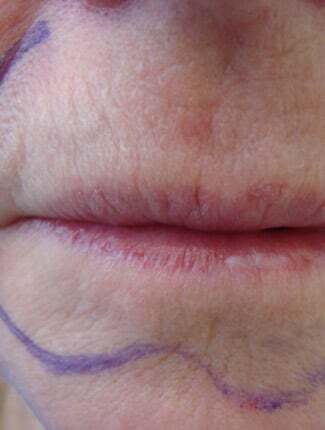 Instead of drawing attention to the fine lines, the beautiful lips of this patient is the focus that draws attention. Could Laser Skin Resurfacing Be the Solution for Me? Laser skin resurfacing is mainly used for patients who have wrinkles around the eyes, mouth or forehead. It can also be a good treatment to tackle shallow acne scars or to treat non-responsive skin after a facelift procedure. Even though laser resurfacing can be used to treat acne scars, laser resurfacing is usually not recommended for patients who still suffer from acne. Laser resurfacing is not used for stretch marks either, considering there are other procedures that are much more effective for the treatment of stretch marks. How Is Laser Resurfacing Executed? Laser resurfacing is a treatment that is executed by Erbium laser or carbon dioxide laser, depending on the specific problems the patient is dealing with as well as the skin tone of the patient. The use of the Erbium or carbon dioxide laser enables the cosmetic surgeon to remove damaged skin cells on the outer layer of the skin, leaving the patient with a more youthful appearance. 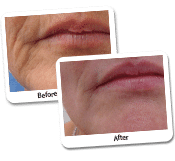 Skin resurfacing has been used for many years as a treatment for wrinkles, scars and enlarged oil glands on the nose. It can also be used for the treatment of specific skin conditions. How Does Skin Resurfacing with Carbon Dioxide Laser Work? The carbon dioxide laser has evolved considerably over the past ten years. The newest version of the carbon dioxide laser works with short pulsed light energy or a continuous light beam. The light source is used to remove layers of skin, but with a minimal amount of heat damage. Patients who had treatment with a carbon dioxide laser usually have to incorporate a longer recovery time than patients who had their treatment with an Erbium laser; this is why Dr Lanzer prefers to use the more advanced Erbium laser for laser resurfacing treatments. The average recovery time for treatment with carbon dioxide laser is approximately 2 weeks, which is still quite reasonable after a cosmetic procedure. How Does Laser Skin Resurfacing with Erbium Laser Work? The Erbium laser is especially designed to remove deep lines and wrinkles on the surface of the skin. 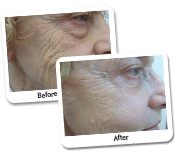 These lines and wrinkles can be treated on the face, chest, neck and hands. Compares to the carbon dioxide laser, the Erbium laser causes even less heat damage to the skin and only causes a minimal amount of side-effects. Patients who have skin resurfacing with Erbium laser will only experience minor bruising of the surrounding tissues, allowing a relative quick recovery time. The average recovery time for treatment with Erbium lase is approximately one week. Skin resurfacing with Erbium laser also works better for patients with a darker skin tone. Should I Avoid Certain Things Before My Laser Skin Resurfacing Procedure? After you have been medically cleared for the procedure, there are some things you should avoid and some things you should report to Dr Lanzer before you have the procedure done. Patients who had cold sores or fever blisters around the mouth should always report this to Dr Lanzer before the procedure. Cold sores and fever blisters may actually cause outbreaks in patients who are susceptible to these problems, so it is best to report them to avoid further problems. There are also certain medications that should be avoided before your laser resurfacing procedure. Patients should avoid all medications and/or supplements that could affect clotting. A few examples of such medications and/or supplements are aspirin, ibuprofen and vitamin E. Patients should stop taking these supplements and medications at least ten days before the laser resurfacing procedure. Being prone to cold sores and fever blisters does not mean you cannot have the procedure done at all. If you are prone to these problems, Dr Lanzer may prescribe some antibiotics or antiviral medications beforehand, which could prevent cold sores and fever blisters from appearing in the first place. What Should I Expect from a Laser Resurfacing Procedure? The duration of a skin resurfacing procedure on the face usually takes up to two hours. If only certain areas of the face are treated, the skin resurfacing procedure can take anywhere between 30 and 45 minutes. Patients should expect some minor swelling and bruising after a skin resurfacing procedure. When you had a skin resurfacing procedure, it is recommended to sleep on an extra pillow; this will help to reduce the swelling. It can also help to put an ice pack on the treated area during the first 48 hours after the treatment. Most patients may also experience some minor itching 12 to 72 hours after the procedure, considering the fact that the skin is healing during this time. Seven days after the procedure, the skin may start to peel slightly. Until the skin has healed, you can minimise redness with some oil-free makeup. If you do not know which brand of makeup to use, be sure to inform about this at the Dr Lanzer clinic, as our clinic can provide you with specialised Jane Ireland makeup.